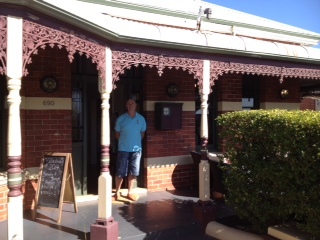 Well today was the day when Trevor and I ventured to Mt Lawley to indulge in the post Xmas spa package that we received for Xmas from Trevor’s brother and his wife. 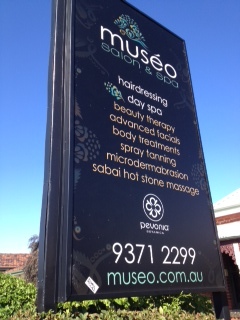 If you are a follower of my blog then you will know the story behind this gift that started with some truly awful after shave that was a joke and ended with a spa treatment for 2 which was why we duly booked and headed to Museo http://www.museo.com.au this afternoon. 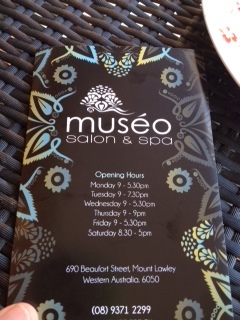 Welcome to the wonderful Museo Salon & Spa! Spa treatments are a bit of an indulgence and usually something that we only get to do when we go on holidays and then see it as part of the relaxing that you do when you visit somewhere like Thailand, Bali or Malaysia. I would love to go and have a spa treatment every couple of weeks but I suppose it is all about priorities and timing but after the visit to Museo today we both agreed that this is something that we should really treat ourselves with and do more often. The package that we had received was a 2 1/2 hour post Xmas package that consisted of a number of elements – each one adding to the over all feeling of relaxation and bliss that we both felt at the end. There was one hitch for our trip today and that was part of our treatment included a cut and style (not really going to work with 2 men who do not have any hair on their heads!) but this had been swapped for a blade shave but the staff who could do that were not available for us today so we have booked in to go back for that in the coming weeks. But the rest of our time at Museo was just perfect. We arrived and were greeted by the wonderful staff. We waited to be collected and were then shown down to the changing room to pop on our robes and slippers then invited into the relaxation lounge where as first time customers we filled out some background on us and at the same time indulged in a spot of lovely herbal tea from Byron Bay. We could have had organic coffee, water, fresh apple juice or a number of other teas but we both thought we would give the aromatic herbal tea from Byron Bay a go and it was just the right thing to start our time at Museo. As we were just starting to unwind and relax we were presented with 2 foot baths of warm scented water to dip our feet in and continue our journey to bliss. After about 10 minutes of sitting back and just unwinding we were led into the treatment room and disrobed and climbed onto the massage table to await the next part of the treatment. This was all about foot, back, shoulders, arms and legs with each area getting special attention. First our feet were exfoliated and then washed and this was followed by them being placed in a bag of warm paraffin which was an amazing feeling and at the end left our feet soothed, relaxed and feeling soft and silky…my feet have not felt that good for a long time! Then our backs were exfoliated and the washed with hot towels and this was followed by a blissful back, neck and shoulder massage and the therapists that we both had managed to work out the knots and even relaxed me so much that I dozed off for a quick nap. There was also massage of the legs that was again joyful and just added to the feeling of total relaxation. Finally the paraffin was removed and our feet were massaged we were left to regain a sense of being and to head back into the relaxation lounge for a glass of water and time to get our minds back on coming back to the real world. We then got ourselves dressed and were lead onto the verandah for the final part of this treatment which was afternoon tea…and what a perfect and civilized way to end a spa treatment! The gorgeous bite size afternoon tea treats for the end of our spa treatments! 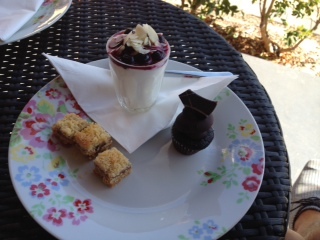 I opted for some more Byron Bay herbal tea and Trevor had a cup of Earl Gray and this was accompanied by a plate each that had on it some delightful natural yogurt with berries, a chocolate overload cup cake and a simply divine raspberry slice. How wonderful it was just to sit on the veranda and continue to relax as we contemplated the rest of our afternoon. Trevor on our way out…you cannot tell but he is totally relaxed and rejuvenated here! As first time customers we were offered 50% of our next treatment and after looking at the list of options we are looking at going back just before we head off on our holiday in 3 weeks to indulge in a facial – I think the perfect excuse for a little pre holiday pampering preparation…don’t you? I would highly recommend Museo, the staff were professional, friendly and certainly knew what they were doing. The ambiance is relaxing and delightful and all of this added up to a lovely 2 hours spent being pampered, something that we don’t ever seem to get enough of.